With their 70 to 64 loss Thursday night, Nebraska’s 20 game winning streak at home has come to a close, which was tied for the longest in program history. The Huskers began the game on a strong foot, generating a turnover and finding a basket at the rim by feeding Isaiah Roby in the paint. However, things wouldn’t go that easy for Nebraska the rest of the night. The Spartans responded by hitting back to back shots from beyond the arc. The Huskers weren’t rattled, though, as it didn’t take them too long to regain the lead. But it wasn’t getting the lead that was difficult. It was keeping it that proved to be a challenge. The lead, which never extended past five points for Michigan State or Nebraska, exchanged hands seven times in the first. 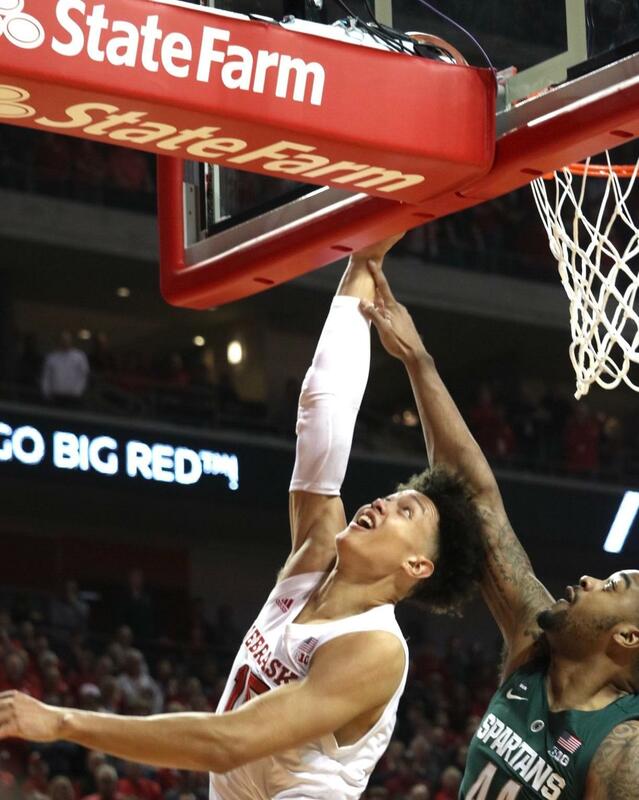 Although the game was tied with less than three minutes until halftime, Michigan State was able to take a five point lead into the locker room, following a few empty possessions from Nebraska. With 90 seconds left, Isaac Copeland missed a pair of jumpers, opening up a window for the Spartan’s explosive guard, Cassius Winston. Winston earned his 16th point of the night by converting a three point play with 11 seconds left. Michigan State turned the ball over nine times, gifting the Huskers an extra 11 points. However, the Spartans cleaned the glass much more effectively than Nebraska in the first half, as they were +7 in rebounding margin. In the second, with the game tied 44-44, Nebraska missed a couple of chances at the rim, which spurred Michigan State on to a 7-0 run, giving the Spartans their largest lead of the night with 6:52 remaining in the contest. The Huskers brought it back to within three, but Michigan State was able to slowly extend their lead. Things got interesting though in garbage time. With less than a minute to go, the lead was twice cut down to four points but the Spartans took care of business at the foul line, icing out the game. Michigan State’s defensive prowess was evident, as they held Nebraska to a field goal percentage of 32.8% on the night. Also, the Huskers were just 1-12 from the three point line in the 2nd half. In total, Nebraska shot just 19.2% from downtown. A couple of players had decent efforts though. Isaac Copeland contributed 13 points. Also, after starting out the game 1-8 from the floor, James Palmer Jr. wound up as Nebraska’s leading scorer in the game with 24 points. The Huskers will have no choice though but no regroup for their next game, which is on the road in Piscataway against Rutgers on Monday. With the loss, Nebraska moves to 13-4 on the season and 3-4 in Big 10 play.